I'm just catching my breath from my visit with my sister and our trip to Tennessee to see our mom. Then home again just to go out of town on business. I will catch up one day. I did a bit of shopping, not to much at the Tree Streets yard sales though. But I did find some cute figurines. You know these are for Beth and she will make them into fabulous pin cushions. Smile! sooo cute, and I can totally see these on Beth’s creations! Those snails are adorable!! Yep, she sure will! So good for her to have a sweet, thoughtful friend like you. You’re a busy lady, Suzy. those are cute! come by and enter my giveaway! Oh, those sure are some cute ones! I hope Beth will post pictures to show us what delights she creates with those! Hi there! I came over from Retro Rosies. I love your blog! You have such fun things. 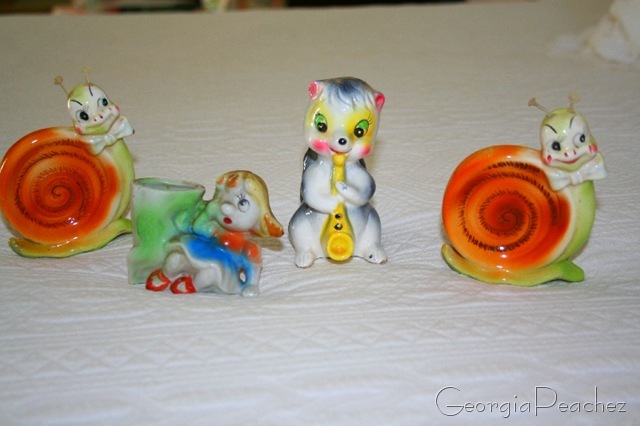 I love the figurines….never seen a snail like that…..too cute! You should pop over to my blog and visit a spell!